The Luxury Trains of India (LTI), a venture of Perfect Travels & Tours Private limited is a destination expert with a trusted name, having its headquarters in Delhi and global presence…established in 1981, is a recognised & approved Inbound Tour operator by Ministry of Tourism, Government of India. Leader for quality & service, with paramount objective of customer satisfaction, Perfect Travels & Tours is the eight times National Tourism winner from Ministry of Tourism, Government of India. 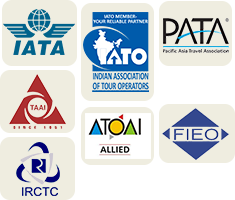 Accredited with National and International membership of prestigious travel associations and backed with over 34 years committed professional service to the tourists from across the globe, we are also an active member of Indian Association of Tour Operators (IATO), holding IATA agency for domestic and international ticketing besides membership of PATA and TAAI.